The Integrated Cancer Centre at Sydney Adventist Hospital is a state of the art Centre of Excellence that builds on the San’s existing expertise, experience and world-class reputation. The cancer centre provides a convenient ‘one-stop’ integrated treatment centre for patients with cancer and other chronic diseases in a caring, supportive and personalised treatment environment. The purpose-built centre provides the gold standard in cancer diagnosis, treatment, management and care through a well co-ordinated and supportive multidisciplinary care model. The San Integrated Cancer Centre also incorporates the San Clinical Trials Unit. This unit is actively involved in clinical research, participating in national and international clinical trials, contributing to improving the future outcomes for our patients as well as providing immediate access to a number of novel and cutting edge treatment options. The recently opened Integrated Cancer Centre continues to reflect and build on the San’s reputation and commitment to excellence in medical services. 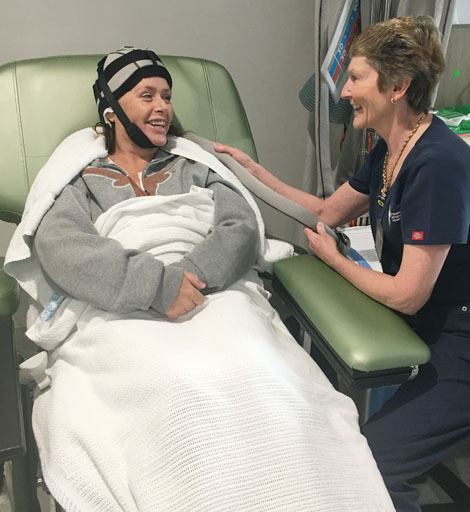 The Cancer Centre has an holistic approach to healthcare nurturing body, mind and spirit, promoting wellness and providing healing treatments with compassionate and expert care. "Patients receiving cancer treatment at the San have access to national and international clinical trials of new and targeted treatments that they would not otherwise have access to. The San is a major contributor to academic and clinical research and is at the cutting edge of current and future cancer treatments."